Why Is There Algae in My Brita Filter? 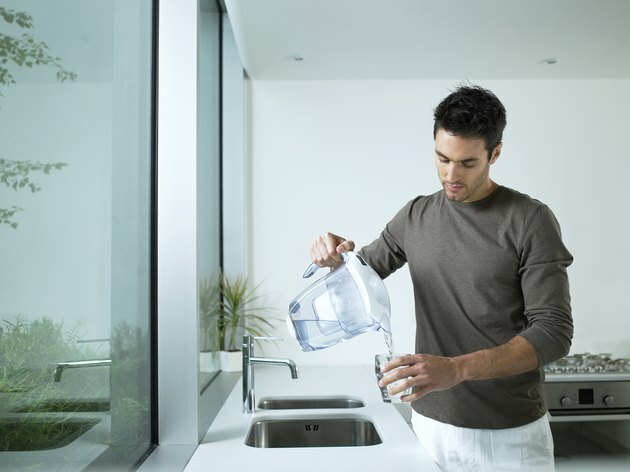 The Brita brand offers filters fitted above a water reservoir on a pitcher for easy storage and dispensing of filtered water. It also makes filters designed to connect to your sink. The filter is designed to reduce chlorine, copper, cadmium and mercury in water and to help improve the overall taste of the water. The filter should generally work well, but if you see algae in the Brita pitcher or filter, it indicates a problem. Likewise, if you see Brita filter mold, it is time to take action. Note that Brita water filters are designed for use with water that is treated municipally or well water that is tested on a regular basis to ensure microbiological safety. If the filter is used with treated water, it is very unlikely tat algae will be a problem. However, sometimes people use Britas for well water that is not tested to be microbiologically safe or treated regularly. In this case, algae is more likely to grow and to be a problem. If you see green algae in the water filter, check your water source. Empty the water out of the pitcher on a regular basis and wash the pitcher with a few drops of dishwashing liquid and warm water. Scrub the pitcher well and rinse thoroughly before refilling the water reservoir with water. This will help prevent the growth of algae in the pitcher. Wipe the faucet filter with a cloth dipped in vinegar to remove any algae that may develop. Regular cleaning of a filter also removes any Brita water pitcher mold. Algae and mold may grow in the Brita filter if the filter is not changed on a regular basis. Filter replacement time depends on the type of product. Brita recommends that a standard filter is changed every 40 gallons, which roughly translates to every two months. However, other filters, like the Longlast Filter, only need to be changed every 120 gallons. Replacement filters can be purchased online and in many grocery, hardware or home retail stores. Store the Brita pitcher in the refrigerator and keep the pitcher filled with water for the best results. If the filter indicator light is illuminated on the faucet attachment, change the filter at this point as well. Descale the water pitcher on a regular basis by dampening a clean cloth or a cleaning sponge with vinegar. Use the cloth or sponge to scrub the inside of the pitcher, which will remove mineral scale and impurities that may lead to algae if not cleaned on a regular basis. Rinse the pitcher with water until no vinegar scent can be detected. The faucet filter system should not need descaling.